Happy Wednesday! 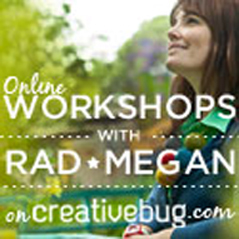 I’m participating in a week-long craft photography blog-hop featuring Sister Diane from CraftyPod, Haley from The Zen of Making, Stacey from FreshStitches, Michele from Michele Made Me, and me, Megan from RadMegan. In my opinion, natural light, aka the light from the sun, is the BEST light to photograph in. You don’t have to worry about expensive set-ups or the “temperature” of your light bulbs, all you need is a couple of neat tricks to diffuse the light. When you go outside on a cloudy day at noon and look in a mirror, you probably look great! No shadows at all, and instead there is a nice even light across your face and hair. Unless you live in an area that is overcast or cloudy all the time, you could probably use a light box to take nice, evenly-lit photos of your crafts. Here’s how you can make one. Step 1.) 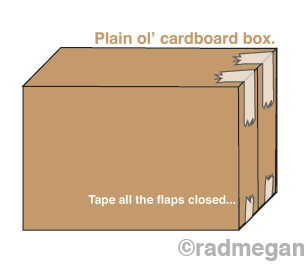 Tape the box closed. Step 2.) 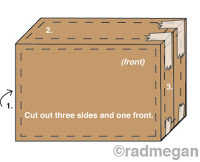 Using your metal ruler as a guide, cut out three panels from the box: Two opposite sides, one front facing, and one on top. I like to leave about an inch and a half border when I cut my panels out for better overall stability. 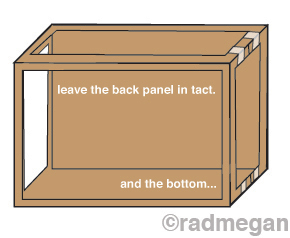 Note, leave the back and bottom panels in tact. Step 3.) 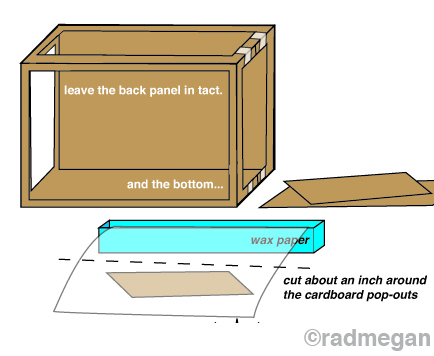 Cut out three pieces of wax paper that are large enough to cover the top, and side panels. I like using my discarded cardboard cut-outs as a template for the correct amount of wax paper I will need. Step 4.) 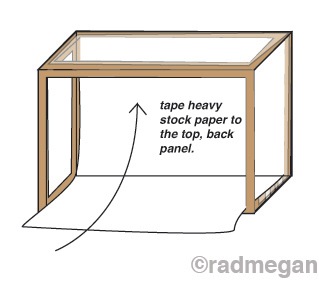 Use your Masking tape and secure the wax paper over the top panel, and two side panels. Work carefully to avoid any wrinkles, cuts or tiny gaps in your wax paper. 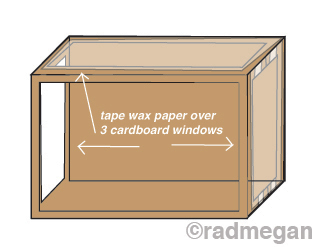 Tape all four sides of the wax paper down to create a sturdy, solid, translucent wall. Step 5.) 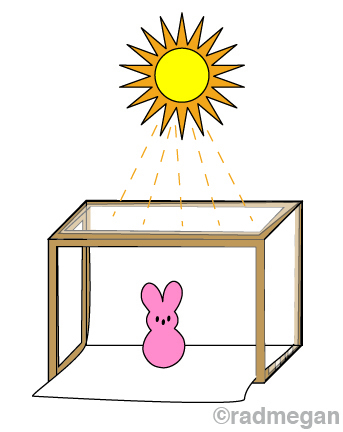 Your light box is nearly done, and only needs a backdrop! Take your heavy stock white paper, and measure it so that it is the same length of your “back wall” in the light box. (The back wall is the one opposite of the only open panel in your box.) Insert the white paper through the opening, and tape it to the very very top of the back wall. It’s fine if the paper is too long and spills out of the box. Avoid folding or creasing this paper, and instead shoot for a gentle curve in the back of your light box. Step 6.) 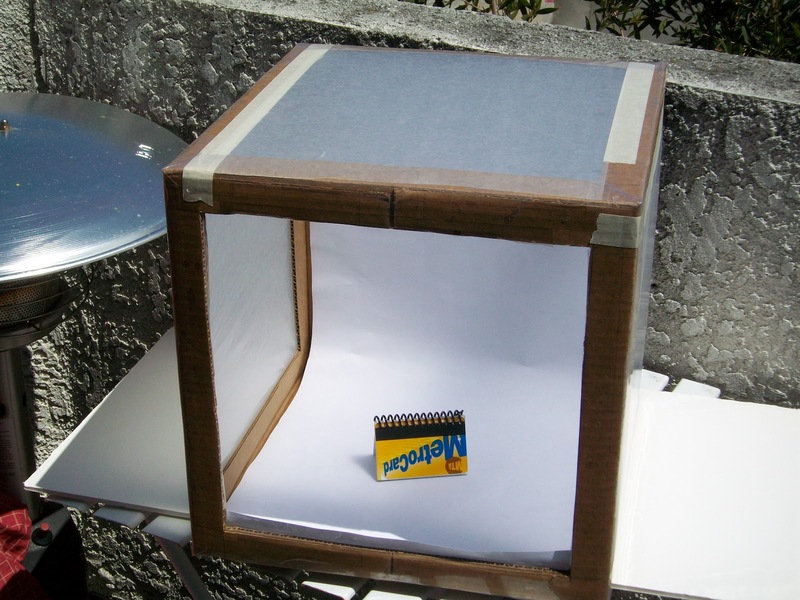 Take your light box outside in the sunshine, place your handcrafted item inside the box and start snapping photos! 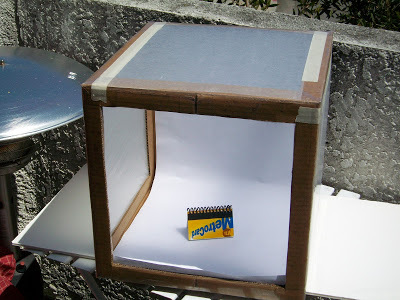 The wax paper will diffuse the light for you and give you an even, well-light photo! 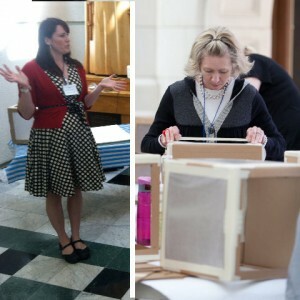 When I taught this workshop at Craftcation, my students were so excited, they went outside with their light boxes to see the difference. 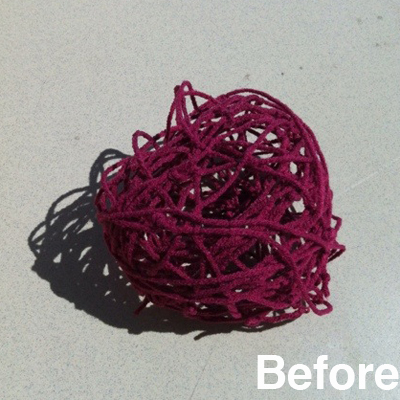 Below are two student photos snapped with a cell phone. 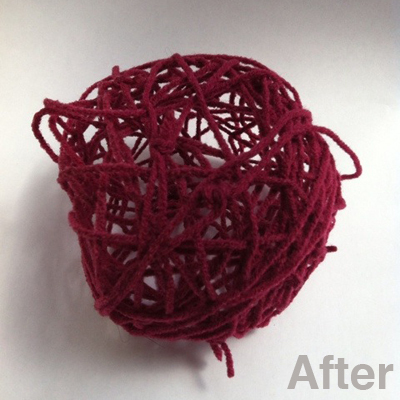 Even with a camera phone, you can see the difference! For more photo tips from me, be sure to check out my two craft photography workshops here and here! 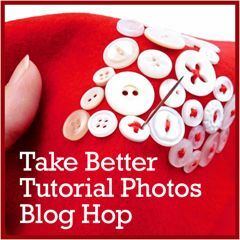 AND as soon as they become available, you’ll be able to find links to all of the other tutorials in this Better Photography Blog-Hop series just below this message. 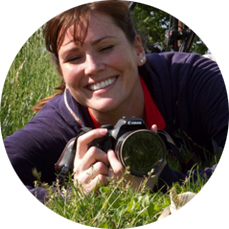 I hope you will visit each blog and check out the tips- so far, I’m loving them all! Big thank you to Haley and Diane for asking me to be a part of this fun and informative week! This is so cool! Thank you for showing us this! Such a useful tool for us crafters. And easy to make with stuff I have around the house, I must say. Thanks so much Megan! 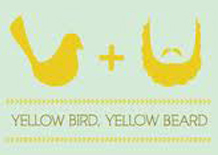 I love the illustrations–they make the whole process look simple and straightforward. Great tutorial! Hi Megan! I saw your snail planters somewhere (can’t search this blog for the appropriate post, my laptop is acting up), and I’, wondering which plants you used for the climbing ones! Thank you so much for posting this – I went to Craftcation 2013, but a light box probably would not have made it back well to the east coast with me. Made one at home! Hi Megan, I’m way behind in finding this only now but I’m sure excited that I did!!! I’m going to try and make one of these light boxes tomorrow Jan-3 but cannot find the long wax paper at my stores nearby so I wondered if I could use white freezer paper instead??? YES! You could also try white garbage bags as long as they are not textured. Good luck! Thanks for sharing the post.It’s most affirmative site. 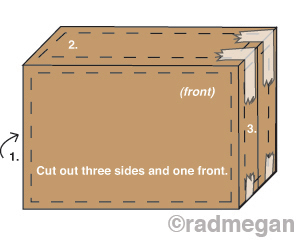 Very easy Cutting of any mettle.The Box Cutter. I love the Box Cutter.